This is where you will find COB's that are garenteed to work beacuse they were tested by none other then me! so go ahead download e'm all! New cobs being added regularly. I Thank all the great people out there who allowed me to post thier COB's on my page Thanx Freya! from the creatures jungle the most for these COB's! This works as a complement to the hang bridge (see below). It connects the treetops with the lookout post by the big waterfall. This cob connects the highest treehouse plateau with the old castle ruins. It gives your norns a new area to reside in, and makes it easier to travel. It´s now possible to drop things on the bridge, and you can also grow triffid plants on it as a fruit source for visiting creatures. I was getting really tired of waiting for the cheeses to pop out of that slow cheese dispensor by the computer, so I made a faster one. This dispensor is movable and contains an endless supply of nutritious cheese for your creatures. This version of the aphrodisiac is more "brain-friendly" than the previous. When injected it puts your norns, ettins and grendels in the mood for mating. 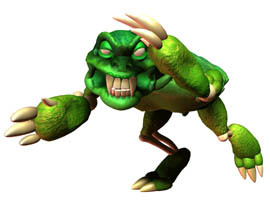 This is the boney Grendel click on the picture and it will link you to the Creatures2 Official site you can learn more about it and download it there.